The unit is on the third floor. It is beautifully decorated and painted with beach theme. Cable TV and high speed wireless internet are provided. Our Gourmet kitchen is fully equipped. It has granite counters, a large island with three chairs and a wine refrigerator. There is also a full size refrigerator in the kitchen. The kitchen, living room and dinning room are connected together in a wide open area. The living room features a 55'' 4K HD TV, Blue Ray DVD player. The large sofa in the living room converts to a queen size sleep sofa. The master bedroom features a king bed, flat screen TV and a DVD player. It has a luxurious private bath that is equipped with Jacuzzi, maple shower with two shower head and granite vanity with two sinks. The second bedroom has a queen bed and private bath with tub/shower. The third bedroom has a double/single bunk bed with a single trundle bed. All bedrooms have flat screen TV and a DVD player. A full bath with shower and glass door is located in the hall next to the third bedroom. The unit has a laundry room with full size washer and dryer. We have been happily married for 21 years with four lovely children, two boys and two girls. We felt in love with the city at the first sight during our vacation in Ocean City in 2008! We love the popularity, the attractions, the restaurants and especially the beach. 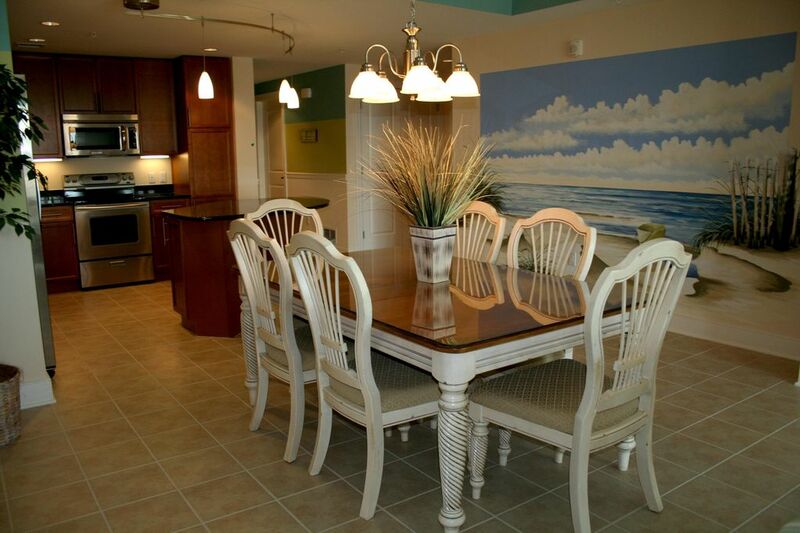 We bought our vacation home at the Gateway Grand because it offers vacationers luxury at the beach! Our unit offers a spectacular ocean view from the private balcony. Cable TV and wireless high-speed internet access provided. For your convenience, the unit provides hair dryers, iron, ironing board, foil, plastic wrap, hand soap, 'starter' toilet paper, facial tissue, dishwasher detergent, laundry detergent, dishwash soap, and trash can liner. Renters also have access to the storage that has beach supplies (chairs, umbrellas, beach cart and beach toys for kids). Our family look forward to providing you with one of the best vacation experiences ever! Covered garage or parking lot next to the building. YOU ARE REQUIRED TO PAY THE FRONT DESK AT CHECK IN $60.00 FOR 2 PARKING PASSESS. Wireless internet is provided in the unit and in the lobby. 1 queen sofa bed with 2 pillows and a blanket. There is an electric Fireplace in the living room. 3 additional chairs around the large island in the kitchen that is connected to dinning room. Blue Ray DVD in living room and in all 3 bedrooms. The Gateway Grand offers luxury vacation at the beach! It offers heated indoor pool and non-heated out door pool, game room, state of the art fitness center with flat screen TVs, convenient outdoor shower, onsite concierge, and 24 hrs security, private garage and parking lot next to building, and five high speed elevators. For your convenient, the unit provides hair dryer in each bathroom, iron, iron board, foil, plastic wrap, hand soap, 'starter' toilet paper, facial tissue, dishwasher soap. This place was perfect for our two families! We had 4 adults and 5 children under the ages of 5! It was roomy and accommodating! The indoor pool was a major plus! We are happy loved our place. Thanks for renting our condo for your vacation. My rental with Trang was exceptional! She was so informative and prompt with all the information we needed. The condo was beautiful and all that was promised! I would recommend this rental, we had a wonderful 10-day vacation there! Gateway Grand has very friendly staff and keep the place secure. Thanks a lot for renting our condo for your vacation. We are glad you are happy with Gateway Grand and our unit. Beautiful condo, was very impressed. Clean and very homey :) was everything detailed in the description, but was more impressed when seen in person, highly recommend. I am glad you loved our condo. Thanks for renting our beautiful place for your vacation. Excellent location and condo was exceptionally clean and equipped with everything we needed. We plan on returning next year and remain excited about the place. The indoor pool and exercise facility occupied our free time since we unfortunately had 4 days of rain so we could not golf. We were able to walk to many close by restaurants without worrying about driving in the rain. The owner was always very quick to answer my inquiries and she was always so patient with me. Each bedroom had its own bathroom which was so convenient. Just love the place!! I am glad you loved our place. I'm sorry that you were not able to goft due to the rain. However, I am glad you were able to use the pool instead. Please contact me when you return to Ocean City next year. Condo was just as pictured. Our family loved the location. It was perfect for us and we wouldn't hesitate to stay there again. The owner was great to work with and made our stay stress free. Thanks for renting our condo for your vacation. you are welcome to rent from us again any time! Awesome property and very spacious for our four adults and two kids. Everything we needed! Trang was also great with communication through our whole experience. Would love to stay again and would recommend! Thanks for renting our condo for your vacation! Few blocks from the Gateway Grand, restaurant 'On The Bay' that opens in the Summer and early Fall is well-known for selling the best CRAB. Across the street is Dumser's restaurant that is known for their famous ice cream. In addition, Seacrets restaurant and nightclub, a family restaurant and bayside beach bar, offer live bands/DJs. Cancellation policy: contact owner for more information $80.00 Condo Administration Fee paid at Condo Front Desk at check in for 2 parking passes (not include in the rent, subject to change without notice). At least one renter has to be 21 years or older to rent. Pillows and blanket(or comforter) are provided each bedroom and sofa bed. 2 keys and 2 fobs/rental. Sunday to Sunday or midweek rental (minimum 4 days rental) are available for off season.